Diamond shaped openings provide security and visibility. Allows good visibility and air circulation. 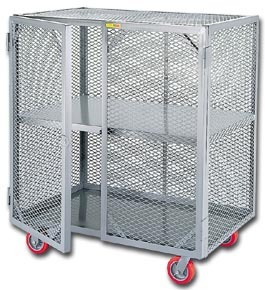 All-welded construction handles loads up to 2,000 lbs. Double hinged doors swing open a full 270Â° back to the sides and out of the way. Includes padlockable hasp. Overall height is 56". Rolls smoothly on 6" x 2" phenolic casters - 2 swivel, 2 rigid. Available with fixed center shelf, or adjustable/removable shelf that adjusts on 3-1/2" increments. FOB Shipping Point. W x D x H Wt. (lbs.) Price Ea.